Well, what can I say? What a great response!!! Thank you so much for taking the time to respond to my request for information on Pte. Davidson and the actions of the 1/5th at Gaza. I still can't quite believe that his bravery is actually given a specific mention in your resources! It sounds like the operations of the day were considered a great succes by Dodington and that he was rightly proud of the men under him. It seems he was somewhat overwhelmed by the numerous individual incidences of heroism that he'd witnessed or had reported to him, and wanted to see that all his men were recognised for their efforts. Also, it's intersting to note the undercurrent of dissatisfaction that Dodington shows towards his superiors, who seemed to have stymied the possibility of an even greater success on the days of the 26th and 27th. David, do you know if you man had any connection to Great Dunmow in Essex? The 1/5 had a very large number of men from Great Dunmow and surrounding villages (Felsted, Little/Great Easton/The Roothings and over into Essex/Herts villages). Col Tom Gibbons was a much respected Great Dunmow man and is buried in the local churchyard. He's precedessor commander of the 1/5th was also from Great Dunmow (sorry can't remember his name). Not too sure about any connections between Pte Davidson and Great Dunmow; my background research has been limited to what I have found on the web. It seems that Davidson was born closer to London, as he is recorded on the births marriages and deaths database as being born in St. Saviour Southwark in the September quarter 1892. He is listed as having lived in Canning Town Essex, which probably explains why he went into the Essex regiment. It might just be that he found himself enlisting at the same time and place as your Great Dunmow men. Sorry I can't tell you any more, but that's all I know! Perhaps GrandsonMichael can tell you more about the contribution of the men of Great Dunmow to the strength of the 1/5th... he certainly came up with a great result while being kind enough to look into Davidson for me. Have seen how busy and helpful you have been with this thread and would like to know if you have any names of officers for the Essex Battery RHA (T) that served in Palestine, from your sources. I am trying to find the Battery Commander please. Thanks, have a good weekend. There is , as far as I can see, just one single reference to the Essex Battery RHA (T) in Burrows, The Essex Yeomanry Vol. 3, page 85. "Ipswitch was the concentration area of the Eastern Mounted Brigade, commanded by Brig.-General H. Hodgson, C.V.O. With the Essex Yeomanry were the Norfolk and Suffolk Yeomanry and the Essex Battery, Royal Horse Artillery, under Lord Belhaven." This was August 1914 during mobilisation. I'm afraid that's all I can find as Burrows concentratred almost exlusively on the Yeomanry (and infantry) units themselves. thanks for your time to have a look. Do you know of any museums or other directions I might head in, to get information on this Battery?? You could try the Essex Regiment Museum. The curator is Mr. Ian Hook and can be reached using the following address: pompadour@chelmsford.gov.uk. I don't suppose there's any mention of Pte Percy Livermore , 1/4th Essex Regiment, killed 19/9/1918 in there? He is a relative of mine.. I'm afraid not. I can, however, send you background information about what happened on September 18/19, 1918 from Burrows, Essex Units in the War 1914-1919, Volume 5. Just PM me with your email address and I'll send you scans of the relevant pages. I would love some help I know that my Grandfather brother Adolphus Mortimer Charles Miller was part of the 11th Battalion Essex regiment.. I know this because on his medal card it saids he was part of the ESSEX R. Prt. #40572 I know he was in the 11th Battalion because it on both of his childrens Birth papers ad Occupation Of father... PRIVATE 40572 11TH BATTALION ESSEX REGT. ok my Q is these children were born in April 1917.. They were twins... was the 11th battalion essex regiment ever in battle.. on his medal card it doesn't say he got hurt. did doesn't say much I will post it her too. so you can see it.. I would love any info or pictures if anyone has anything they would love to share.. The 11th Battalion The Essex Regiment was raised in September 1914 and trained in Shoreham/Brighton/Shoreham, England. It was part of the 72nd Brigade, 24th Division. (Later on the 11th joined the 18th Brigade, 6th Division). On August 30, 1915 the Battalion entrained for Folkstone to arrive in France the same day at Boulogne. It trained again for the next three weeks and marched off to the front on September 21, 1915. Some days later the 11th Essex was sent to the front and was part of a battle called the Battle of Loos. From then on it saw lots of action till the end of the war. Your great uncle wasn’t awarded the Star Medal which means he joined the 11th Battalion after January 1, 1916. I noticed the information Owen4256 gave you about the possible dates that great uncle was wounded. Looking at the War Diary of the 11th Battalion, it was in billets and training during November & December 1917. So it is likely that he was wounded in October, there were casualties on the following dates: 9-10-17/12-10-17/17-10-17 & 28-1-17. During July 1918 there were casualties only on the 30th and in August 1918 there were casualties only on August 1st as far as I can see. Have you ever heard the nick name ‘Dusky’ being used for your great uncle? This man, a cook of the 11th Battalion, is mentioned in the history of the Battalion, written by J.W. Burrows. In that book there are six photographs of the 11th Battalion. If you send me your email address, I’ll send you scans of these pictures. They were all made during the training period in England, so your great uncle will not be depicted in them, I’m afraid. Hi Michael, When you have time could you tell me any thing about Capt Arthur John BEARD MC 10th Essex? I have extensive papers on him but wonder if there any snippets in the volumes you have? No rush..what a great service you offer!! I have his gazettes and NA papers ans well as his divorce records and WWII RAF papers..(he eventually became a RAF WC), I am keen to learn more about his WWI exploits. Not much to add I'm afraid. He is mentioned once in Burrows, The War 1914-1919, Volume 6, page 140, when the Battalion entrained and embarked on 24th/25th July 1915 for France. He is mentioned twice in Lt.-Col. T.M. Banks, D.S.O., M.C. and Captain R.A. Chell, D.S.O., M.C., With the 10th Essex in France (Naval & Military Press), page 25, where he is sitting behind a piano and page 62, where is mentioned that Second Lieutenant A.J. Beard (Bombing Officer) got his jaw broken by a West gun (?) and was invalided to England. If you P.M. me your email address, I'll send you scans of the relevant pages. Hi Michael, That was fast!! I have the book With the 10th Essex in France (Naval & Military Press) but would love to see scans of the page in Burrows. Many thanks for your help!! Not sure about the CO of the 1/1 Essex RHA, but the 2 i/c was Major Alastair Hope Kirk TD. I think there should have been a Volume 7 - Essex Artillery units RHA/RGA/RFA, most indignant there isn't! I think you will have an uphill struggle Stephen, there is a unit history for one of the batteries of the Essex RFA, but other than that there are slim pickings. Unless someone can tell me differently? I would be SO happy for someone to tell me differently! Second Lieutenant A.J. Beard (Bombing Officer) got his jaw broken by a West gun (?) and was invalided to England. I realise that I'm nine months late here but if you are still keeping an eye on this thread, the West Spring Gun was a catapult with an arm powered by a bank of springs, and by all accounts equally dangerous to both sides, so it is more than likely that the unfortunate 2nd Lt Beard got in the way of one! My pleasure, Michael. Unfortunately pictures of the West are hard to come by. I know one has been posted on the forum - if you can work the search facility better than I can, you might find it! Do you have any information about the 2nd Line Territorials, in particular the 2/6th. My Gt-Gt Uncle died in of pneumonia at West Ham Hospital aged 39 (see signature). I was wondering if you have any idea of the battalions whereabouts in the early spring of 1916. Yes, there is a short narrative about the second and third line units in Burrows, vol. 5. He does mention that many of the records have been lost and that is was very tough to try to trace their history. Sorry, that’s all, so I can’t answer your specific question about the whereabouts of the 2/6th in the early spring of 1916. Thanks for the information, it certainly narrows down as to what he may have been up to. It all helps so thanks again. Sorry, nothing to be found in Burrows, Volume 5, Essex Territorial Infantry Brigade. No worms, no mention of your man. 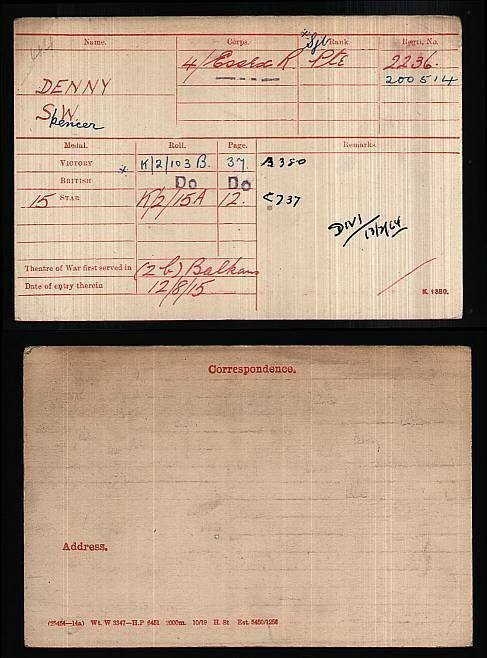 Are you still able to provide scans of the pictures of the 11th Battalion, mentioned earlier? My great-grandfather John Edward Cole was a sergeant in the 11th Essex, & I'm interested in any infrormation on them. Sorry for the delay, I've been on holiday. PM me your email address and I will send you the scanned pictures of the 11th Bn. men. There is no personal mention of your great-grandfather in the Burrows' book I'm afraid.